Polychloroprene (CR)/ Neoprene is the polymer name for the synthetic rubber known as neoprene. This rubber was developed in 1931 and supposed to be the first specialty elastomers. It has good mechanical strength. It has high ozone and weather resistance. This rubber has good aging resistance. It has good resistance toward chemicals. Moderate oil and fuel resistance. Polychloroprene can be vulcanized by using various accelerator systems over a varied temperature range. It is less resistant than natural rubber to low temperature stiffening. But this can be compounded to give improved low temperature resistance. This rubber is suitable for use with mineral oils and greases and dilute acids and alkalis. 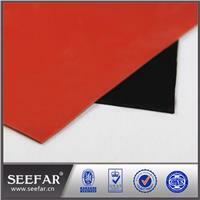 Neoprene rubber is used in various technical areas, mainly in the rubber industry. This rubber is also important as a raw material for adhesives which can both solvent based and water based. It also has different latex applications (such as dipped articles (like gloves), molded foam as well as improvement of bitumen. Application areas of this elastomer are widely spread like moulded goods, cables, transmission belts, conveyor belts, profiles etc. Polychloroprene (CR) is and will continue to be one of the most important synthetic speciality type of synthetic rubber because its balance of properties is unique.